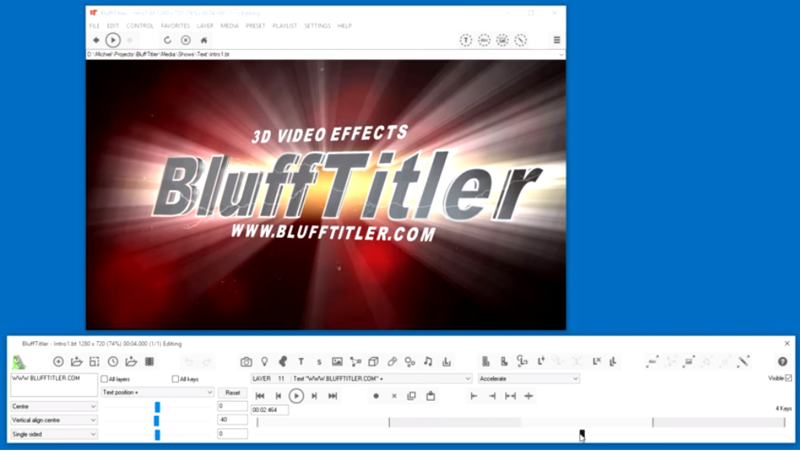 BlufffTitler is an amazing tool for creating intros and especially titles for your videos. It is indeed important to present yourselves well if you want someone to watch your videos till the end. BluffTitler helps you in creating fantastic intros which can help you gain the attention of the viewer right in the beginning. The best part about BluffTitler that I see is that it is pretty easy to use. You can create stunning and eye-catchy but yet complex visuals in no time. Its ease of use and speed helps it to be one of the great in its niche. If you want to create the same visuals using any 3D animation tool it would take considerably long time. So, this makes even a beginner in the video editing business to start using it right away. When you open BluffTitler what you see on the screen are two floating windows. One of the windows display the video which has been created so far. The other window contains the controls which you can use to control the effects and properties of the elements in the video. There is a text box on the left side to enter the text you want as your title. There are also options to change some parameters of the text. Different elements can be placed in different layers which make it easier to work with. You can change the position of the text even with the Z axis because this is a 3D title creator software. There are different options on the top in the control window which can be used for different tasks like opening a new template, saving and exporting the current work, adding effects and particles to your work and more. To make things ever easy and fast to do, BluffTitler comes with a variety of presets which can be tweaked to your liking. With a little bit of tweaking, you can come up with your own original intro video. Now let us look at some of the features of this amazing intro video making software. The latest version of BluffTitler is version 12. So, here are features of this tool. DirectX 11: BluffTitler is powered with DirectX 11 which comes installed with all the Windows PCs. It also helps to take advantage of the amazing graphics capabilities of the system. New 3D models: There were 3D models in the previous versions of BluffTitler as well. But now new models have been added. 3D models can bring more life to your video. Mirror Layer: Mirror layer can be used to create reflections for your planes in BluffTitler. In-app Tutorial: You can view tutorials for different options in the software being in the tool itself which saves you the time for searching for the related keyword in the search engines. Video Resolution: You can choose video resolution from SD to Ultra HD. You just have to enter the resolution you want in the video resolution box. Export: BluffTiter can export your creation in AVI format. AVI is a video format that can be imported in almost all video editing and compositing software on the planet. You can choose the video compression rate and even the framerate of the video. One of the great things is that videos can be exported with transparency in it (called RGBA). This can help you can integrate other videos with your video in any video editing software. In my opinion, there is no reason why you should not try BluffTitler. It will impress you with its speed and ease of use in creating fantabulous titles and intros. If you really are a video content creator then this software is one of the tools that you should possess. BluffTitler single user easy licence is € 29.95 and pro licence is € 49.95.